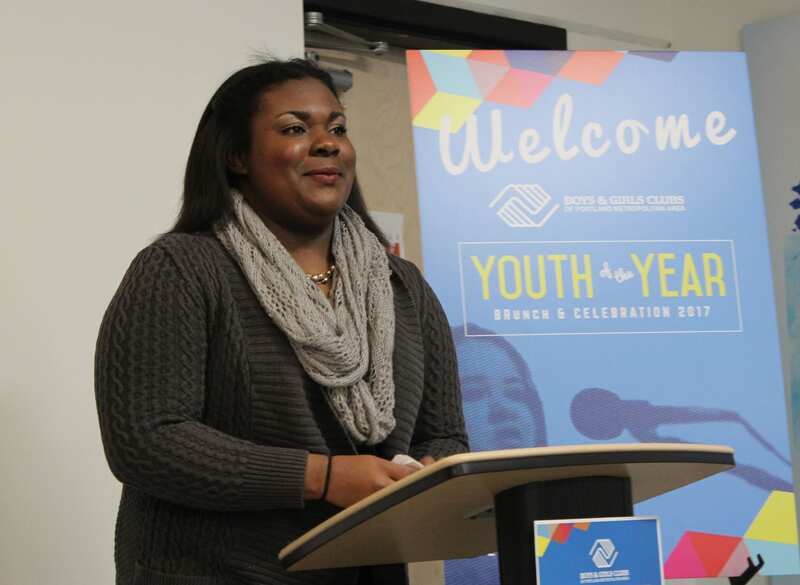 Kaleha Keenan, a sophomore at Roosevelt High School and 10-year member of the Regence Boys & Girls Club in New Columbia, was selected as the Boys & Girls Clubs of Portland Metro’s 2017 Youth of the Year on Friday, February 3, 2017. During the selection process, a panel of judges heard speeches from each of five Metro Area Youth of the Year candidates, conducted one-on-one interviews, and then announced the winner at a small gathering at the Blazers Boys & Girls Club on MLK JR. Blvd. Kaleha is an only child and the Club has served as a second home and family for the past 10 years. Kaleha is a leader in and out of her Club, serving as the freshman class president, a mentor to youth in the Club, and a participant in the K-CHING Program. Kaleha was also an organizer for “Hoodies Up Day” at her school – an Action Project that calls for solidarity in speaking out against racism and inequality. Along with the title, Kaleha received a $1,000 scholarship and will continue on to represent the Portland Metro Clubs at the Oregon State Boys & Girls Clubs Youth of the Year competition in March to be held in Salem. After high school, she plans to attend Spelman College to become a lawyer. Throughout the year, Portland-Area Clubs select a Youth of the Month. From the Youth of the Month candidates, a young person is chosen to represent their local Club as Youth of the Year. Kaleha competed with four other outstanding Club members representing Club communities from Hillsboro and North Portland. Other finalist included Alejandra Alvarado (Regence Club in New Columbia), Samantha Arroyo Villanueva (Inukai Club in Hillsboro), Mayra Estrada (Inukai Club in Hillsboro), and Jonathan Contreras (Inukai Club in Hillsboro). All four runners-up received a $500 college scholarship.